Many years ago (17 to be precise) I built a Cessna T-37 model for the game "Operation Flashpoint". So on bit of a whimsical tour I decided to upgrade the model for iClone... The transition from it's early days in a 3D application called oxygen to Blender for additional modeling and rigging with bones has been fine, however I'm finding it difficult to work out how to get the takes (from Blender animation timeline) to work as 'perform' commands in iClone. I know how to set up the clips in both Blender and 3DXchange, but each time I use a perform command it resets any other animations. For example I might want to raise the undercarriage which is fine, but the moment I animate the elevator or ailerons the under carriage resets to down position. I have tried using the torus animation method of setting up individual parts centered at 0,0,0 with localised pivots for each part as well, which is mentioned on this site, and other localised methods of animating and capturing 'perform' sections. Always I get the same result; any new perform resets the animations. Any ideas please, would be greatly appreciated. Does each motion start and end at different times? Is the model rigged to a skeleton, or are you attaching the different parts as sub-props? I have tried both methods. The picture is the second method. At this point the pivot points are set at each part. I can get the parts animated, but the perform part has me stumped. When you say "ANY ideas" I assume you only mean ideas hat work as performs, because you are selling this prop, right? Because the idea that immediately occurs to me nowadays is to use Python instead. I do this and it works fine -- my script animates the subprops and can do it independently of each other (I'm going to guess a perform acts like a motion clip on the entire model and thus you can only have one because the other ones reset -- however, I'm pretty ignorant about that whole process). It was easier in previous versions of iClone, but it can be done in 7 & you can have multiple performs for a single prop. 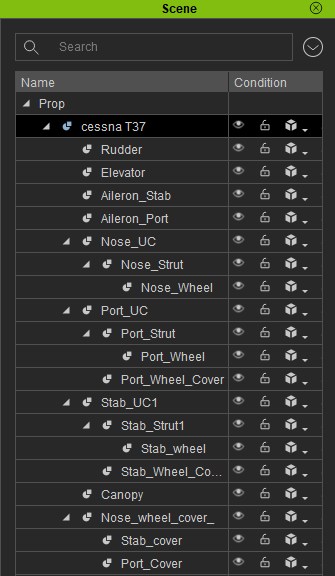 First- in iClone, select each sub-props and ensure the pivot points of EACH sub prop is set to rotate that item exactly where you need it (for example center, center for wheels, at hinge edge for doors, etc). use edit pivot if the prop is not square to the world axis. Second - once the main prop (in this case the plane) is set to center bottom middle & all sub-props have their respective pivot points set, select the plane & MERGE the subprops. Third - select the plane prop once all sub-props have been merged, right click on it in your scene & select modify-animation, then click the EDIT ANIMATION LAYER in the modify panel. Using your timeline and the animation editor with everything expanded, you can select the individual parts that were merged and animate. Once you have completely animated all the parts you want for this single perform function, collect the clip & add it to the plane's perform menu. You can repeat the process to add multiple performs as the plane can have as many animations in the perform menu as you desire. For example, one perform may be "lower flaps", another may be "lower flaps_turn rudder", another may be "lower flaps&wheels", etc. I use this methodology regularly for animating appliances, amusement park rides, doors, windows with shutters, bicycles, motorcycles, etc. If you would like further clarification, and /or demonstration, please email me at grannyj@grannyjs3dattic.com and we can arrange a time when I will share my screen & walk you through it. HI Mike. I used to animate (or should I say set up a model for animation) models when I worked for Bohemia Interactive creating aircraft for their military sim. Generally the game engine would have the animations built in and I'd have to set the models pivot points (rudder, flaps, etc) in the model itself then create a c++ configuration file that set up my (aircraft say) as a subclass of the base aircraft class that was in the game engine. That done it was a matter of compiling the model and configuration file and the model was good to go. However if there were additional parts of the model that needed to be animated within the model (gun turrets, opening canopies, doors, etc) a secondary file would be created. This was essentially a script file that pertained to the particular model which allowed the player to access those extra functions. While it sounds complicated it isn't once one understands the concepts and commands needed in both configuration and scripting files. That said I have been quite excited about the use of python to animate props in iClone. Given time I guess I will give it a shot. In the meantime I've always been confused with iClone's animation and perform commands. I can recall the vehicle in iClone 5 which used the perform commands to move the vehicle and open and close doors, all that seemed to work fine without one perform resetting another. I do think aml scripting language was used then. Hence the dilemma at which I am now facing. And yes, this aircraft, along with several others will be put up into the store. Sub-Props - pivots set where needed. Select plane and merge Sub-Props. Select plane and open the "Edit Animation Layer." It is a rather simple, be it tedious process, but it is easy to do. Just follow the steps I outlined. 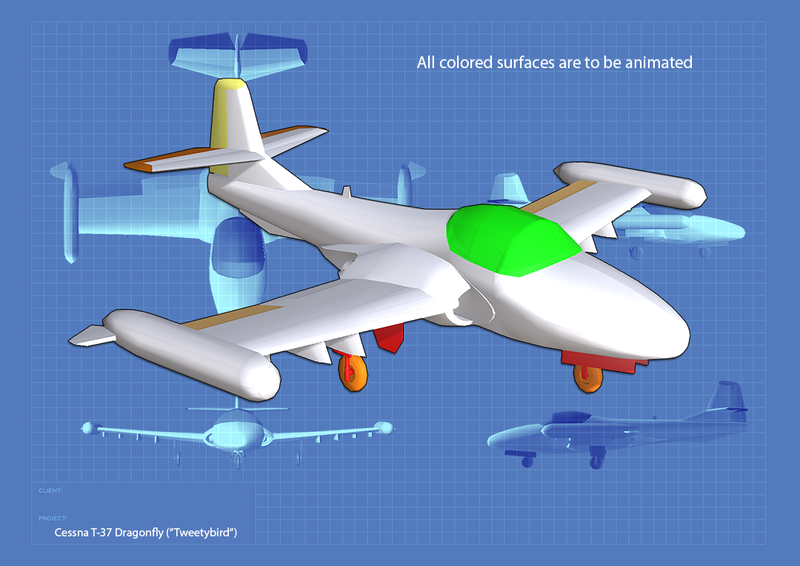 If you'd like, send me your plane ( you can email it to grannyj@grannyjs3dattic.com or put it up on Dropbox or Google Docs & send me the link) and a list of the animations you want in the plane's perform menu & I will create a step-by-step tutorial for you to go by.